People who've known me for a long time are often surprised to hear that, in the waning days of the cold war, I consulted for NATO. Two years later, in 1989, I published an article about the experience, "A Spy In the House of War: My Life as a NATO Collaborator." Twenty two years later, in 2011, I found out that twenty years earlier, in 1991, I had won an Olive Branch award for the article, but was never told. CACM column: Whose net is it anyway? Multimedia electronic mail will the dream become a reality? Perils and pitfalls of practical cybercommerce -- Note that this is the *draft* that I sent to CACM, and does not include CACM's edits for publications. Borenstein, Nathaniel S., and James Blake, "Cloud Computing Standards: Where's the Beef? ", IEEE Internet, May/June, 2011. Borenstein, Nathaniel S., "Whose Net Is It Anyway? ", CACM (Communications of the ACM), April, 1998. Borenstein, Nathaniel S., "One Planet, One Net, Many Voices: The Story Behind CPSR's Principles for the Internet Era", The CPSR Newsletter, Volume 16, Number 1, Winter, 1998. Borenstein, Nathaniel S., "One Planet, One Net: CPSR's Campaign for Internet Governance", The CPSR Newsletter, Volume 15, Number 4, Fall 1997. Borenstein, Nathaniel S., et al., "Perils and Pitfalls of Practical Internet Commerce," in Readings in Electronic Commerce, Ravi Kalakota and Andrew Whinston, editors, Addison-Wesley, 1997. Freed, N. and N. Borenstein, "Multipurpose Internet Mail Extensions (MIME) Part Five: Conformance Criteria and Examples", RFC 2049, December, 1996. Freed, N. and N. Borenstein, "Multipurpose Internet Mail Extensions (MIME) Part Two: Media Types", RFC 2046, Internet Standard, December, 1996. Freed, N. and N. Borenstein, "Multipurpose Internet Mail Extensions (MIME) Part One: Format of Internet Message Bodies", RFC 2045, Internet Standard, December, 1996. Borenstein, Nathaniel S., "CMU's Andrew Project: A Retrospective", Communications of the ACM, Virtual Extension, December, 1996, Volume 39, No. 12. Pages 298-311. Borenstein, Nathaniel S., et al., "Perils and Pitfalls of Practical Cybercommerce," Communications of the ACM, June, 1996. Borenstein, Nathaniel S., et al., "Commerce on the Net: New Ways to do Business", EDI Forum: The Journal of Electronic Commerce, Volume 7, Number 4, 1995. Medina, Manel, and Nathaniel S. Borenstein, editors, Upper Layer Protocols, Architectures, and Applications, North-Holland, 1994. Borenstein, Nathaniel S., "EMail With A Mind of Its Own: The Safe-Tcl Language for Enabled Mail", IFIP WG 6.5 conference, Barcelona, May, 1994, North Holland, Amsterdam, 1994. Reprinted in Upper Layer Protocols, Architectures, and Applications, M. Medina and N. Borenstein, editors, North-Holland, 1994. Reprinted in Readings in Agents, M. Huhns and M. Singh, editors, Morgan Kaufmann, 1998. Borenstein, Nathaniel S., "The text/enriched MIME Content-type", RFC 1563, January, 1994. Borenstein, Nathaniel S., "A User Agent Configuration Mechanism For Multimedia Mail Format Information", RFC 1524, September, 1993. Borenstein, Nathaniel S., "The text/enriched MIME Content-type", RFC 1523, September, 1993. Borenstein, Nathaniel S., and Ned Freed, "MIME (Multipurpose Internet Mail Extensions) Part One: Mechanisms for Specifying and Describing the Format of Internet Message Bodies", RFC 1521, Draft Internet Standard, September, 1993. Borenstein, Nathaniel S., "MIME: Multipurpose Internet Mail Extensions", Multimedia Systems, Issue #1, June, 1993. Borenstein, Nathaniel S., "Fathers and Daughters", The Sun, May, 1993, p. 31. Borenstein, Nathaniel S., and Mark Linimon, "The Extension of MIME content-types to a New Medium", RFC 1437, April 1, 1993. Borenstein, Nathaniel S., "MIME: The New Internet Standard Format for Multimedia Email," EDD '92 Conference, Parsippany, New Jersey, October, 1992. Borenstein, Nathaniel S., "Enhanced Mail as Application Infrastructure: MIME, Metamail, and the Second Generation of Email", invited paper, Infocom '92, Bombay, November, 1992. Borenstein, Nathaniel S., "Enhanced Electronic Mail as Application Infrastructure: MIME, Metamail, and the Second Generation of Email", invited paper for Infocom '92 conference, Bombay, November, 1992. Borenstein, Nathaniel S., "Andrew & MIME: How Messages 8.5 Accomodates the New Mail Format Standard", Andrew Consortium Technical Conference, Pittsburgh, 1992. Borenstein, Nathaniel S., "MIME (Multipurpose Internet Mail Extensions): A Standard Format for the Second Generation of Internet Mail", OSN: The Open Systems Newsletter. Borenstein, Nathaniel S., "Multimedia Electronic Mail", invited article for Encyclopedia of Microcomputers, Marcel Dekker, New York, 1992. Borenstein, Nathaniel S., "Colleges Need to Fix the Bugs in Computer Science Courses", Chronicle of Higher Education, July 15, 1992. Borenstein, Nathaniel S., "Internet Multimedia Mail: Emerging Standards for Interoperability", Proceedings of the IFIP TC6/WG6.5 International Conference on Upper Layer Protocols, Architectures and Applications, Gerald Neufeld & Bernhard Plattner, editors, North Holland, Amsterdam, 1992. Borenstein, Nathaniel S., "Computational Mail as Network Infrastructure for Computer-Supported Cooperative work", CSCW '92 conference, Toronto, November, 1992. Borenstein, Nathaniel S., "Multimedia Mail From the Bottom Up, or Teaching Dumb Mailers to Sing", USENIX Winter '92 conference. Reprinted in ConneXions magazine. Borenstein, Nathaniel S., "A Bottom-Up Approach to Multimedia Mail", ConneXions magazine, November, 1991. Borenstein, Nathaniel S., "An Expanding Universe of Electronic Communications", Bellcore Exchange magazine, November/December 1991. Borenstein, Nathaniel S., Programming As If People Mattered: Friendly Programs, Software Engineering, and Other Noble Delusions, Princeton University Press, 1991. Borenstein, Nathaniel S., and Ned Freed, "MIME (Multipurpose Internet Mail Extensions): Mechanisms for Specifying and Describing the Format of Internet Message Bodies", RFC 1341, Proposed Internet Standard, June, 1992. Borenstein, Nathaniel S., "A User Agent Configuration Mechanism For Multimedia Mail Format Information", RFC 1343, June, 1992. Borenstein, Nathaniel S., "Implications of MIME for Internet Mail Gateways", RFC 1344, June, 1992. Borenstein, Nathaniel S., and Chris A. Thyberg, "Power, Ease of Use, and Cooperative Work in a Practical Multimedia Message System", Int. J. of Man-Machine Studies, April, 1991. Reprinted in Computer-Supported Cooperative Work and Groupware, Saul Greenberg, editor, Harcourt Brace Jovanovich, 1991. Reprinted in Readings in Groupware and Computer-Supported Cooperative Work, Ronald Baecker, editor, Morgan Kaufmann, 1993. Borenstein, Nathaniel S., "Multimedia Electronic Mail: Will the Dream Become a Reality? ", Communications of the ACM, April, 1991. Borenstein, Nathaniel S., "MAGICMAIL: A Secure and Portable Language for Enhanced Email Services", Human Computer Interaction Consortium conference, Ann Arbor, 1991. Borenstein, Nathaniel S., "Why Do People Prefer FAX to Email? ", IFIP WG 6.5 International Symposium on Message Handling Systems, Zurich, October 1990. Reprinted in Message Handling Systems, P. Schicker and E. Stefferud, editors, North-Holland, 1991. Borenstein, Nathaniel S., chairman, "Report of the Multimedia Mail Workshop of the IFIP WG 6.5 MHS '90 Conference", in Message Handling Systems, P. Schicker and E. Stefferud, editors, North-Holland, 1991. Borenstein, Nathaniel S., Multimedia Applications Development with the Andrew Toolkit, Prentice-Hall, 1989. 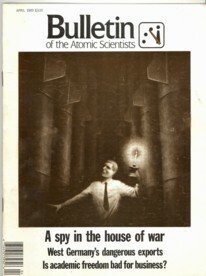 Borenstein, Nathaniel S., "A Spy in the House of War: My Life as a NATO Collaborator", Bulletin of the Atomic Scientists, April, 1989. Borenstein, et al, "Architectural Issues in the Andrew Message System", Proceedings of IFIP Conference on Message Handling Systems, October, 1988. Reprinted in Message Handling Systems and Distributed Applications, E. Stefferud, O-J. Jacobsen, and P. Schicker, editors, North-Holland, 1989. Borenstein, Nathaniel S., and Chris Thyberg, "Cooperative Work in the Andrew Message System", Proceedings of the CSCW '88 conference, Portland, Oregon, September, 1988. Borenstein, Nathaniel S., and James Gosling, "UNIX Emacs as a Test-bed for User Interface Design", ACM SIGGRAPH Symposium on User Interface Software, Banff, October, 1988. Boyarski, D., C. Haas, and N. Borenstein, "Carnegie Mellon's Andrew: The Evolving User Interface of the Messages Program", Poster at CHI '88, Washington, May, 1988. Borenstein, Nathaniel, Craig Everhart, Jonathan Rosenberg, and Adam Stoller, "A Multi-media Message System for Andrew", USENIX Technical Conference, Feburary, 1988. Blower, et. al, "Embedded Training and Help: Opportunities for User Support", Final Report of NATO Workshop on Human Factors in Command and Control Systems, September, 1987. Borenstein, Nathaniel S., "The Role of On-line Help in Command & Control Systems", invited position paper, Ibid. Rosenberg, J., C. Everhart, and N. Borenstein, "An Overview of the Andrew Message System", SIGCOMM '87 Workshop, Stowe, August, 1987. Borenstein, Nathaniel S., "Is English a Natural Language? ", in Foundation for Human-Computer Communication, North-Holland, 1986. Borenstein, Nathaniel S., "Is Natural Language a Natural Command Language? ", in Proc. IFIP Working Conference on the Future of Command Languages, Rome, September, 1985. Borenstein, Nathaniel S., "Help Texts vs. Help Mechanisms: A New Mandate for Documentation Writers", in Proc. SIGDOC Conference on System Documentation, Syracuse, NY, June, 1985. (reprinted in Asterisk, Volume 12, Number 6, pp. 8-10, 1986. Borenstein, Nathaniel S., The Design and Evaluation of On-line Help Systems, Ph. D. thesis, Carnegie Mellon University, May, 1985. Borenstein, Nathaniel S., "The Evaluation of Text Editors: A Critical Review of the Roberts & Moran Methodology Based on New Experiments", CHI '85, San Francisco, April, 1985. Clitherow, Peter, Michael Muller, and Nathaniel Borenstein, "Docu-matic: Improving Customer Access to Electronic Documents", Bellcore QIA '90 conference, October, 1990. Clitherow, Peter, Michael Muller, and Nathaniel Borenstein, "Electronic Publishing of Intelligent Documents", Bellcore Electronic Document Delivery conference, February, 1991.